Rowan berries may not be the most popular berry on the market but they taste wonderful when cooked and used in your pies, jams and jellies and have a surprising number of excellent benefits for your health. We have written plenty on this site about the health benefits of various berries. Some of them like the blueberry are very well-known while some others are a little more obscure. One thing is certain, many berries come with a wide variety of health benefits. They tend to be highly antioxidant and full of nutrition. They are bitter and can be toxic when eaten fresh, but when they are cooked they become edible and make a great ingredient for jams jellies and sauce. There is a commonly held belief that rowan berries are poisonous and it is true that eating too many will make you sick. However, nobody would want to eat these berries by the handful. They are very bitter, but become edible, delicious and highly nutritious when they are cooked. Rowan berries are the small fruit which grow on the rowan tree. The tree, which has a scientific name of Sorbus domestica, is a desiduous tree belonging to the rose (Rosaceae) family. It can grow to a height of 30 meters and be up to 20 meters in diameter. It is native to many parts of Europe, Southwest Asia and Northern Africa but is cultivated more widely these days for commercial and domestic reasons. The rowan tree can live for at least 100 years in the wild. It flowers during the spring time months and the bears its fruit from late in July to the middle of October. Rowan berry is also known variously as chess tree, Sorb tree, Mountain ash, Whitty pear and Service tree. The edible fruit ranges in color from bright shades of orange and red to yellow, pink and white. The small fruits are oval in shape with a slightly bitter flavor when eaten fresh. Rowan berries contain a variety of important nutrients including vitamin C, vitamin E, scorbic acid and dietary fibers. Like most berries, they are also very high in healthy antioxidants like quercetin that help protect your body from oxidative stress caused by free radicals. The fruit is dried and ground down to treat intestinal troubles including diarrhea. A decoction made from the ripe fruit has been used to treat sore throats, swollen tonsils and pain. They have been used to treat scurvy because of their high vitamin C content. Because of their astringent properties, rowan berries have been used traditionally to treat a variety of problems including piles and hemorrhoids. The fruit has been used as a laxative. Because they are rich in natural antioxidants, rowan berries can help support general health and reduce the risk of disease. Oxidative stress is at the root of many major diseases including heart disease, brain disease and cancer. Rowan berries can help to support your immune health while research indicates they contain antibacerial properties that can reduce the risk of infections. Not only are the fruits beneficial to your health, but the leaves and the bark are also used in folk medicine. They have been used traditionally to treat various illnesses including liver and kidney disease, digestive complaints and diabetes. 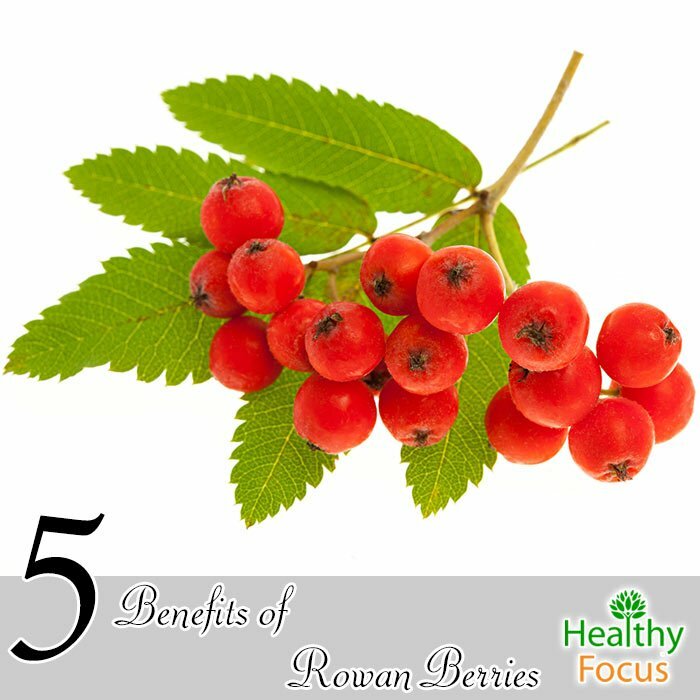 Rowan berries have a high level of various antioxidants including quercetin and scorbic acid. These powerful antioxidants can help to prevent the damage to your cells caused by free radicals that we encounter in our daily lives. Free radicals cause oxidative stress which is at the root of many serious sicknesses including cancer, heart disease and degenerative disorders associated with aging. There has been no research into the effects of rowan berries on serious illnesses in humans but quercetin, scorbic acid and the vitamin C present in rowan berries have all been thoroughly researched. They are known to help reduce the risk of various serious illnesses and also to slow down the aging process. Antioxidants are not only good for your internal organs and cells but they can also help you retain a youthful skin complexion for that bit longer. They are also responsible for speeding up the healing process and can even prevent eye disease like macular degeneration. Although they can hardly be described as a nutritional powerhouse, rowan berries are a good source of vitamin C. Getting plenty of this vitamin is extremely important for maintaining good health. It acts as a natural antioxidant and also helps to enhance the production of the body’s white blood cells. It gives your body a much needed immune system boost which will help you stave off illness especially when cold and flu season comes along. In addition to its functions as an antioxidant, vitamin C also helps numerous other bodily functions such as the production of collagen, blood vessel repair and improving the health of muscle tissues. Rowan berries can be good for your digestive health and we know that a healthy digestive system is key to overall health and well-being. The dietary fiber in the berries help to add bulk to your stools and stimulate your digestive tract which can ease constipation and relieve many other symptoms of poor digestion such as cramps, bloating and dyspepsia. Traditionally, rowan berries have also been used to treat diarrhea but the precise reason that they may work is not clear. The scorbic acid that is produced when Rowan berries are cooked is a powerful antioxidant but it is also associated with other health properties. The acid is believed to have antimicrobial actions that can destroy bacteria both internally and on the skin. Many commercial cosmetic products use Rowan berry extracts as an ingredient in their cosmetic products because of their antimicrobial actions. Rowan berry juice has traditionally been used to treat inflammation of the respiratory tract and asthma. It has also been used to help relieve congestion and soothe a sore throat. The reason that it works is unclear but it likely has something to do with its antioxidant compounds. Rowan berries should not be eaten raw. They can be toxic especially in large amounts and furthermore, they taste extremely strong and bitter. However, when they are cooked, the toxic substance called parasorbic acid is transformed into healthy scorbic acid which is good for you. It is important therefore to cook your Rowan berries first and then you can happily use them to make delicious jellies and jams. Provided you can find the fresh fruit, rowan berry jelly is easy to make at home by following this simple recipe. Put the water in a pan and add your berries. Warm them up on a lowish heat until the water begins to simmer. Remove the mixture from the heat then allow it to steep for 5 or 6 hours…preferably overnight. Next, strain your liquid through a cheesecloth of muslin sheet. You should be left with around a liter of juice. Add your pectin according to the instructions found on the packet. Store the jelly in a jar in a cool, shaded area and serve it up with a wild game or poultry dish. Berries can be a very tempting site for your curious children so it is important that they know what is safe and what may harm them. While a child is unlikely to become severely ill from eating a berry or two, they may well have a nasty tummy ache but are unlikely to suffer any severe symptoms. That being said, warn your children not to eat them to prevent an uncomfortable lesson. When properly cooked, Rowan berries are healthy rather than harmful However because they contain parasorbic acid in their uncooked state, you need to be careful to cook them properly. Do not eat fresh Rowan berries. When you eat them in large quantities they can cause a range of symptoms including stomach pain and diarrhea, cramping, vomiting, nausea and even kidney damage. Rowan berries can cause skin irritation and rashes. Pregnant women and nursing mothers should be especially careful.